Executive Office Centers can provide meeting room rentals for meetings, interviews and depositions. We have three (3) Portland meeting rooms. We can comfortably accommodate up to 12 people in beautifully appointed surroundings. We also have day offices that are available as meeting rooms as well. These are well-appointed and have the same business services available. Beverage service and fiber optic internet services and VOIP phone are included in the fee. Videoconferencing is available in any of our conference rooms. Our business support services (fax, secretarial, etc.) are also available to help make your meeting more successful. Rentals of Portland Meeting are available for existing tenants or non-tenants. 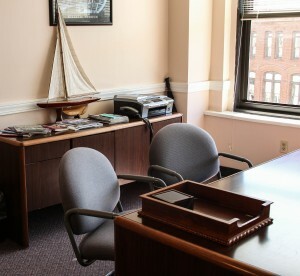 If your company would like to hold its next board meeting or personnel interviews in Portland, Maine, then Executive Office Centers has the best location. We are the only Portland meeting rooms space with an attached parking garage as well! Book a meeting room today, or contact us to discuss.